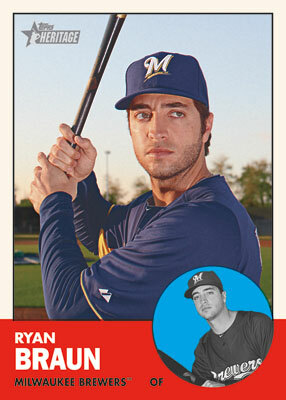 This morning, via Twitter, Topps released an advanced look at 2012 Topps Heritage Baseball Cards. 2012's release will be based on the 1963 set of Topps Baseball cards. Heritage is always a great chase for set builders and it looks like the 2012 version will be some nice cards to collect judging from the Ryan Braun card above. 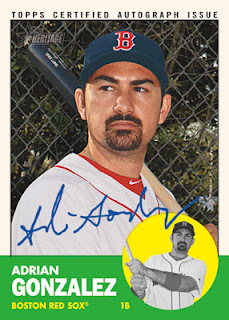 As with past releases, 2012 Topps Heritage will have two sets of autograph cards, one in blue and one in red which should be numbered to 63. Here is a look at those. Adrian Gonzalez in standard blue ink and the newly announced Willie Mays in Short Print red ink. 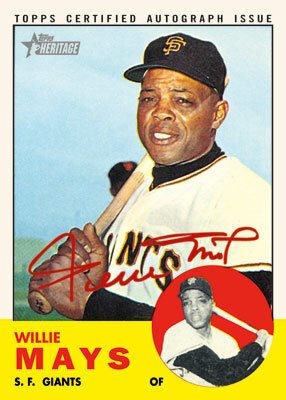 Minus the Topps Certified Autograph Issue marking on the top, the Willie Mays card is essentially a reprint of his 1963 card. This looks like it's going to be a sharp set. Thanks for the preview. They sure look good. I regret not getting more into the Heritage Cards. Maybe when I get more of my Vintage Sets completed. Hey thanks for the preview! I really wish they'd get rid of the stupid short prints. It just makes collecting it more expensive, not more fun. William, the last couple of summers, I've decided I'd work on one old set and one new set. So I worked on the 2011 Heritage and filling in my '62 and '63 sets. I love the excitement of ripping open a pack, and I love searching through boxes for old cards, so I get a little of both!